American Airlines is moving to partner with Aer Lingus on transatlantic routes, in a move similar to its alliance with Aer Lingus’ IAG sisters British Airways and Iberia. Tom Lattig, American’s MD for EMEA sales, told Travel Extra: “We have filed an application both in the US and here to add Aer Lingus to our joint business. It would add a lot of new product in our combined portfolio.” Aer Lingus has applied to join the transatlantic joint venture operated by its parent, IAG, but sources conceded that any growth in the venture requires Washington to view it as a positive step for consumers too. The move could see the two airlines developing new routes together – making new destinations more feasible than going it alone – and also codesharing. 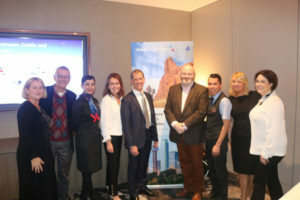 Mr Lattig was speaking as American Airlines celebrated its upcoming direct route from Dublin to Dallas Fort Worth at a lunch in Ballsbridge’s Clayton Hotel with Tourism Ireland, the DAA, British Airways representatives and media. Mr Lattig cited the case of its existing relationship with British Airways opening up opportunities for airlines and passengers across the Atlantic. As well as point-to-point trade, the new Dallas service opens up attractive new twin centre opportunities for tour operators, said Caitriona Toner, Country Sales Manager Ireland. Caitriona and Tom talk about the possibilities for tour operators and travel agents with the new route. Watch here. With flights arriving into DFW into early evening, connections (minimum time 60-90 minutes) are available the single terminal facility. “The timing is very good for Cancun and Las Vegas, and there is the option to fly home via London with British Airways.” There are 900-plus flights a day out of American Airlines’ biggest hub, with Mr Lattig saying Dublin passengers will now have “35 unique connection opportunities that you don’t have today”. Mr Lattig said the airline has carried 3.7m passengers at Dublin since operations, originally under the US Airways brand, started in 2003. Jenny O’Connor, GM for American at Dublin Airport, said the customer-facing staff at the airport are now all in-house, which she believes is better for customer experience. “We have gone from nine to 55 staff,” she said of the airline’s growth.